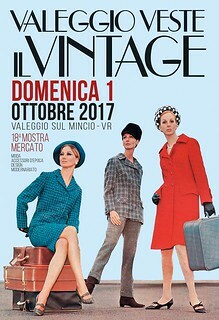 Enjoy the first days of the autumn season with Valeggio Veste il Vintage, the usual open air tradeshow on vintage fashion, antiques, design and collecting that turns the centre of Valeggio sul Mincio in a lovely retro scenario for a day. A.N.G.E.L.O. will attend as usual with a selection of vintage clothing and accessories you can't miss out.